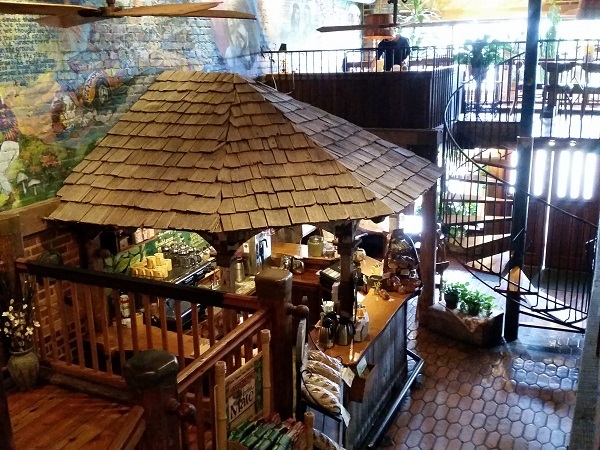 The Yellow Deli, Chattanooga TN – Marie, Let's Eat! Since 2012, I’ve taken five “circumnavigations,” little two-day eating fests around areas that we don’t often visit. I checked the calendar, and another one was coming up on the horizon as a maybe, and my daughter expressed a desire to see her mother in Kentucky for a little while. I decided to turn the traditional circumnavigation into a drop-off trip instead and expanded it with extra time in Nashville on the way up and a great big wonderful detour on the way back. The circumnavigations have historically been opportunities for me to try lots and lots of barbecue, but I had several different things on this trip. 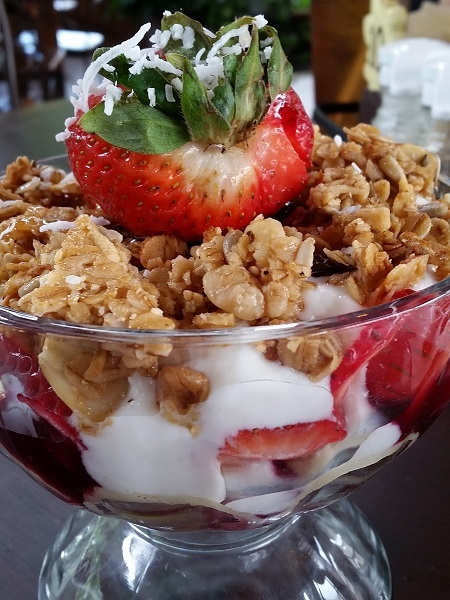 For starters, we stopped in Chattanooga at The Yellow Deli, where my daughter had a gigantic yogurt parfait that was just full of fruit, and I had their remarkably messy and popular Deli Rose sandwich. The Deli Rose is not pictured because it is, without question, the messiest sandwich that I have ever eaten. I attempted to raise it from its basket so that I could photograph something other than the top of the bread, but the mayo, mustard, and special sauce had completely soaked the bread and the heel was already disintegrating, falling apart and soaking my hand as I touched it. The bread was very, very good, and so were the roast beef, corned beef, tomatoes, onions, Provolone and pepper jack, but the sandwich was so wet that even the crustiest French bread would have trouble maintaining consistency. “And what do you think?” I asked. I wouldn’t say that it’s excellent, because it was just too wet, but it was still quite good. There’s a fine sandwich here waiting to exhale, but it needs to not be so drowned. I tried asking my daughter to observe the situation and the people and let me know what she deduced from them, but she is a very, very impatient teenager and just wants to be told what’s going on. I asked her to observe the simple clothing that the employees wear, and the very long hair on the women. What did she make of the quiet acoustic music, the murals on the walls, the funky lettering? She replied, “They’re Irish? I don’t know, I give up.” I said that I’d tell her when we left, and picked up the latest two issues of their newspaper on the way out. That’s when I dropped the bombshell that The Yellow Deli is run by a religious group called Twelve Tribes, and, not to be too blunt about it, but they’re a cult. Wish I’d have recorded her exclamation of shock. Gene and Marsha Spriggs started their church in the spring of 1973 following an argument with their pastor about whether it was acceptable to cancel services on Super Bowl Sunday just because most of the congregation had announced that they weren’t coming. They follow very strict rules about gender and child discipline, live communally, and have attracted concern and attention from cult awareness networks ever since. There are eleven Yellow Delis in three countries, plus at least one bed and breakfast. Reading over their history, I was astonished to learn that there was briefly a Twelve Tribes commune in Mentone AL in the late 1970s. I figured that was exactly the sort of thing to get people in Fort Payne, my parents’ hometown which is in the valley just below Mentone, talking and gossiping. To my surprise, neither my mother nor her husband had ever heard about this, so I suppose that they kept to themselves. 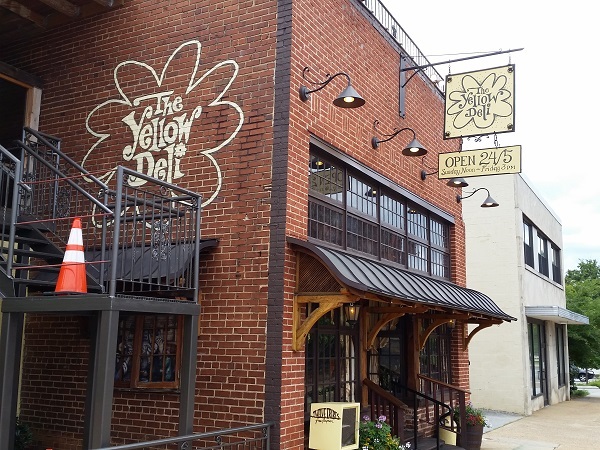 The Twelve Tribes closed the original Yellow Deli and left Tennessee for Vermont in 1978, returning to the Scenic City in 2008. They keep the Deli open “24/5 — 24 hours a day, five days a week: from Sunday at Noon until Friday at 3,” closing to observe the Sabbath on Saturday, Their restaurant is very comfortable and quiet, with a lovely patio and a nice, dark interior with comfy couches and medieval-style music gently playing. Students from UTC camp here for hours, sipping tea and studying. Posted on July 5, 2015 August 22, 2017 by Grant G.Posted in chattanooga, dessert, regional chains, sandwiches, tennesseeTagged chattanooga, deli, dessert, sandwiches, tennessee. I don’t know why, but the idea of a cult running a food establishment just creeps me out like crazy. Your description of the sandwich, however, made it sound terrific! I enjoyed reading about the Twelve Tribes. These days, they appear practically whimsical, almost like a RenFest version of Hare Krishnas, but in the 1970s, they really did shock the daylights out of the locals. Chattanooga was not ready for hippie communes then. Huh. You’re right, that might explain it. Thanks! I patronized their original (modest) location on Brainerd Rd. back in ’73 and loved the food. Fast forward to now — this is a much larger restaurant and the food is even better than before because the bread here is baked from scratch. I don’t recall the original site having a bakery. In my opinion, everything on the menu is outstanding. Thanks for the comment! Now that we live in Chattanooga, I’m certainly planning to stop by the Yellow Deli again in the not-too-distant future.